"My wife and I just wanted to tell you how happy we are with the new Trane heating and cooling system that you installed at our house recently. 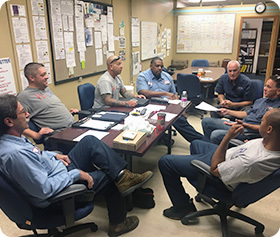 We were impressed with the high level of professionalism that your employees displayed and we are very happy with the quality and value of the Trane products. We will not hesitate to recommend you to anyone needing your services. It is very clear why Angie's List has given you such high marks for eight consecutive years." "This past week a 3 man team from your company installed a new furnace and A/C at my home. I was greatly impressed by their workmanship, courtesy and work ethic. They worked together as a smooth, united team. Thanks for sending such a good team." 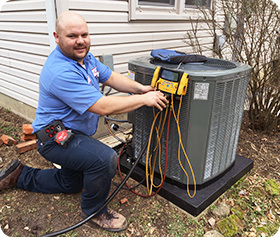 "Our neighbors had recently used your company to replace both their heating and cooling systems and highly recommended Hetter for the job. The Trane name in addition to a competitive price and special offers made Hetter the right choice." All the research that I did in comparing HVAC systems (Carrier, Bryant, etc) it seemed like other companies would compare themselves to Trane....There are alot of companies in the Columbus, Ohio area that sell Trane. I was very fortunate to find a company that did a great job! That company was Hetter Heating & Cooling...Please note that I do not often participate in consumer surveys but I felt it was important to let you know the integrity and high STANDARDS this company has set for itself and to let you know that you are well represented by a company like Hetter Heating & Cooling." "We are thrilled with the new heat pump ! We cannot believe how quiet it is compared to the old heat pump. As soon as we get some free time, we will write a letter so that you can share our positive experience with others. As for now, if any prospective clients ask for a referral, feel free to give them our phone number and we will be happy to tell them what a great pleasure it was working with you. Thanks again!" "Wanted to let you know the guys were here and did a great job installing the new heat pump. Yes it is as quiet as you indicated. The guys were very knowledgeable about what they were doing, explaining what they were going to do, and answered all of my questions. They showed me how to use the thermostat and brought warmth back into the house. I would say I was lucky and got your A team to do the install in the quiet cold March weather. Give the guys an attaboy from me and if you like it certainly can be posted on your bulletin board. These guys were aces all the way." "Rick & Jerod did a fantastic job today. I was so impressed with everything. They were courteous, knowledgeable and very hard working. The attention to detail from protecting my carpeting to installing the furnace with all of it's challenges, is very much appreciated. I will definitely be recommending your company. " "Just wanted to let you know that I was very pleased with they guys that came and installed our AC. Professioanl, personable, lovely. Will certainly refer your company." "I just returned from out of town and am catching up on e-mails. I was very happy with the way Hetter performed the installation - they were very considerate, and did a clean, neat job. Rick followed up with calls, and the furnace has been very efficient. I even noticed a decrease in my electric bill. As for the AC, Hetter came out over a week ago to test the system and make sure it was ready for the summer. It seemed quiet to me. 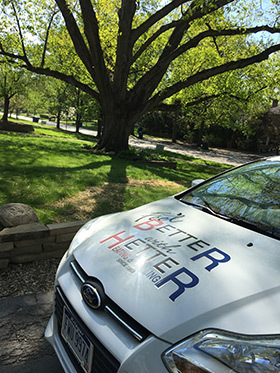 If you choose Hetter, I hope you enjoy your experience with them, as well as their Trane product, as much as I do." "Thanks so much for your professional efforts and, again, of the three companies I have contacted, I am very pleased with my choice to call Hetter. Please let Chuck (and Chuck's direct report) know what a professional first impression of the company he made on this customer. Also, I will definitely save you a mimosa seedling as they establish their roots over the next two months." "Hello: I wanted to let you know that the Columbus City Inspector was here to examine the installation of my new water heater. Of course, the installation passed with flying colors. He kept saying, 'What nice work. Look at the beautiful work. What a nice job.' I would also like to add my compliments re the courtesy and professionalism of the gentleman who installed my water heater. Excellent workmanship and courtesy -- an unbeatable combination. Kudos! " "Jason was here yesterday for our semi-annual HVAC tune-up. I am grateful for your company's customer service. We had a new system (heat and AC) installed in June, 2011 and it has worked flawlessly and with the new energy efficient unit, has saved money on our utility bill. Jason did a great job (for as much as I know about checking an AC unit!). Great to have you as a vendor." "I was extremely impressed with your solution to my furnace problem earlier this March. Called you at 8AM and had a new furnace operating by 4pm same day. That's what I call great customer service. Thanks again to the whole Hetter Team!" "I wanted to convey my appreciation for the tremendous service with the installation of the furnace a couple of weekends ago. The technicians were very professional and pleasant and performed the installation in a very timely manner." "Smart, friendly and resourceful: those are the words that first come to my mind when I think of Hetter. Rick figured out our house�s heating and cooling needs, and then proposed consolidating our two climate systems into one thereby giving us a system more efficient and appropriate for our small house. Hetter worked with me when I postponed the installation, and when the day came to start the complicated project which involved extensively rebuilding our ducts to make them work with one system I knew I had made an excellent choice in Hetter. The workers were extremely friendly, tidy, and detail-oriented, and they were always glad to talk about and explain their work. 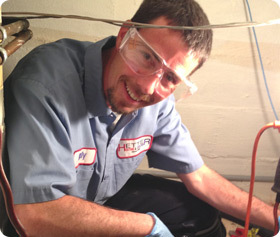 When we need to replace our water heater, we�ll no doubt call Hetter again. " We are an Accredited Business with the Better Business Bureau. Hetter Heating & Cooling is a 2016 recipient of the BBB’s Torch Award for business ethics. We have won the Angie’s List Super Service Award the last eighteen years in a row. Please check our record. How many companies — honestly — will ask you to do that? We are committed - with every installation, every service run and every phone call — to your complete satisfaction.